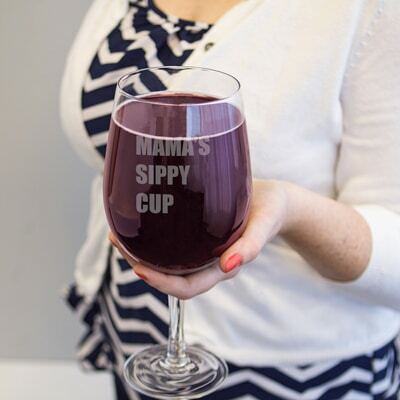 This glass holds an entire standard bottle of wine (our kind of sippy cup)! We’ll engrave with a large uppercase initial OR up to three lines of custom text for no additional cost. Our Personalized 25 oz. Novelty XL Wine Glass is the perfect gift for any wine lover! Featuring an oversized bowl top and elegant stem, this massively huge wine glass will hold an entire bottle of wine! 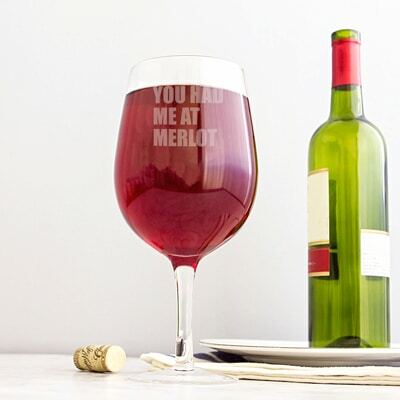 Pair it with our Personalized XL Beer Glass, and you’ll surely be toasting to great weekend memories to come! Grab one for each member of your wedding party and we will engrave with either three custom lines or a single block initial at no additional cost! Holds one standard bottle of wine. 9” L x 4.25” W.